The LUMii 1000w 400v Digital Ballast is the entry point into professional level 1000w lighting. Giving you many of the features of more expensive ballasts without the high price. Switchable between 600w, 750, 1000w and able to boost to 1150w you have full control to keep your plants at their optimum light and temperature levels. 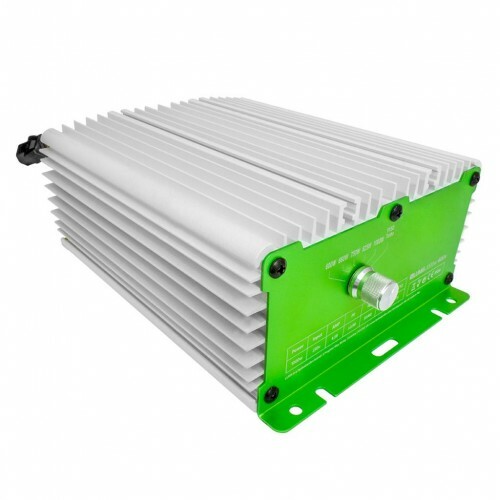 The LUMii 1000w 400v Digital Ballast converts mains electricity to the correct voltage and current to start-up and power a 600, 750 or 1000 Watt HPS or MH lamp by using a microprocessor to constantly monitor and control a digital power-output system. Digital Ballasts produce more lumen output, use less electricity and do not degrade with age like core and coil type ballasts which become noisy, use more electricity and produce less lumens as they get older.